All the gear and no idea is an observation often made of golfers and no doubt competitors in many other sports. As a golfer, I like to buy the latest golf clubs, clothes and gizmos most of which are a waste of money in getting me around the course in the lowest score that befits my handicap. A better investment would be lessons to improve my swing, but that involves changing old habits, practice and learning new skills. Much easier to buy the latest hit it further club! Golfers also complain of inconsistency, the ability to put all elements of the game together and to improve year on year. What amateurs also forget is a game plan that links a strategy for improvement, with golfing skills and abilities. This is no different from an organisation’s ability to link their strategic objectives with a game plan to achieve them. Organisation’s usually have all the gear in terms of KPIs, smart goals, vision and mission statements, performance reviews and 1-2-1 meetings. However, they usually have no idea in terms of pulling it all together with a process that consistently and systemically links together the strategy with the implementation elements. These implementation elements being the individuals that do the work. If your organisation has no idea, then you are far from alone as “…surveys over the past two decades indicate that 60-80% of companies fall far short of the targets expressed in their strategic plans” Kaplan & Norton – The Execution Premium. Kaplan & Norton’s research also shows that companies using a formal system for implementing strategy consistently outperform their peers. The result of having no idea is to fail, year on year, to achieve the strategic objectives and realise the benefits of enhanced capabilities and improved financial performance. This perennial failure to bridge the gap between strategy and execution becomes an implicit acceptance of failure, resulting in organisations not expecting to achieve their strategic objectives. So what can be done to play consistently and improve your handicap? The first thing is to recognise that you need help in developing strategy execution management as a core competency of the organisation. Why should you be any good at it if you have not been trained and taken lessons from the pro? – Far easier to avoid any change and carry-on with the old habits of failure. 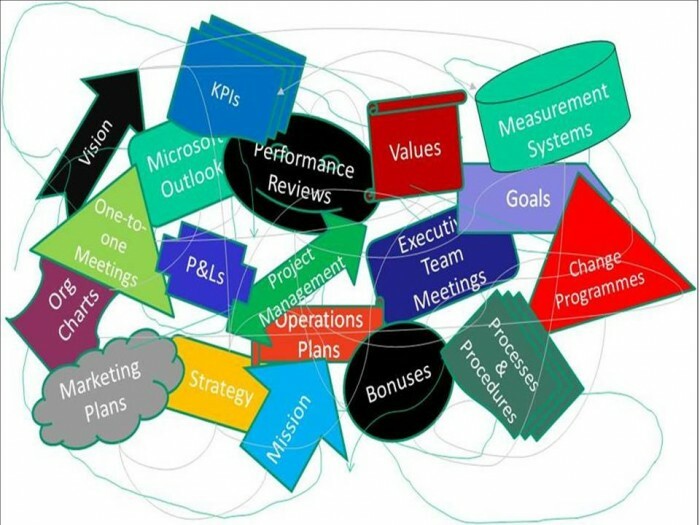 Strategy Execution Management is a process, driven by the leadership team, that engages personnel at all levels so that they understand the strategy, their part in achieving it and what is expected of them. Managers discuss these expectations with their subordinates for inclusion in a performance agreement. It is key that individuals produce their own performance agreements and they are not written and imposed on them by their managers. Performance Agreements integrate the day job activities with the goals and new activities required to support the strategic initiatives. The goals describe what success and failure looks like and the strategic initiatives that they support. These Performance Agreements provide the basis for management of an individual’s performance. This management is done through regular (6-12 times a year) progress meetings held between a manager and subordinate, to evaluate performance and progress in achieving the goals. The role of the manager is to help an individual to be successful in their day job and deliver the goals. This is a joint enterprise and so may identify areas of weak performance requiring additional support or training. As progress meetings are held on a regular basis, the reasons for under-performance can be dealt with while there is still time to do something about it. Pulling it all together needs a structured process and system support, which is why BluePlate Consulting has complemented their business architecting approach by being appointed the UK partner for the KeyneLink Strategy Execution Management system that has been successfully implemented in over 700 clients in North America over the past 15 years. Keynelink is part process and part roadmap with cloud based system support. Talk to your pro Jeff Herman at BluePlate Consulting. Performance management generally refers to measuring past performance and making an adjustment or two in order to increase performance next time. In the workplace, you perform to some standard, and your boss measures your performance to see if it met the standard. Based upon the results of that measurement, you adjust your performance (or the standard) as necessary in order to meet it the next time around. At its essence, it’s nothing more than an employee appraisal process that the human resources department typically owns. Execution management is a bit different. Execution is the act of doing something, and when you manage execution, you’re focused on managing an act rather than a result. That’s not to say that execution management is or should be about micro-management – far from it. But shouldn’t management be about leading, guiding, and motivating people to greatness rather than simply judging them at the end? Shouldn’t management be about leading, guiding, and motivating people to greatness rather than simply judging them at the end? Organizations usually set goals at the beginning of the year and then look at them again at the end of the year to see if they were met. Based upon this annual review, adjustments are then made for the coming year. But what if a football coach managed its players this way? The coach would set a goal at the beginning of the season to win 15 out of 16 games, let’s say, but only at the end of the season would he look back and discover that they only won six. That would be one sure way of getting fired as a coach, wouldn’t it? Instead, the players are coached throughout the game, and the game itself is reviewed in detail at its conclusion. This way, players can make adjustments as they go. Shouldn’t organizations work that way, too? Shouldn’t they practice execution management the same way that sports teams do? It’s not enough to manage the execution of individuals in an organization; rather, individuals’ activities need to be driven by the organization’s strategy and goals. Just as the individual football players’ activities are driven by the team’s, management’s, and owner’s goals, so must individual employees’ activities be driven by higher-level goals and strategies. Unlike performance management, execution management is owned by senior executives. It starts with defining the strategy and continues with the execution of it. While the purpose of performance management is to determine how well employees are performing for succession planning, training, merit raises, and the like, the purpose of execution management is to successfully carry out the strategic plan in order to realize the organization’s vision. Because strategic plans are identified at the highest levels in an organization, execution management is the ultimate responsibility of the executive team. Performance management, on the other hand, is typically the ultimate responsibility of Human Resources. If you want a system that merely looks at past performance of employees to see if they deserve a raise or a bonus, a simple performance measurement system will do. But if you want to manage the successful execution of your strategic plan, take a look at Keyne Insight’s strategy execution management system at http://www.keyneinsight.com.